* Maintenance Support is 20% of licenses package amount (billed annually). 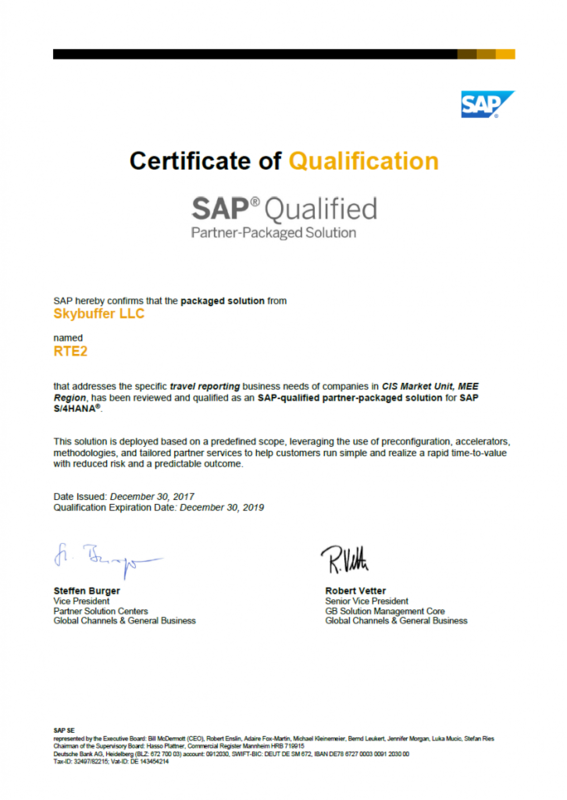 /SKYBFR/RTE2 ECO EXPENSES is SAP Qualified Partner-Packaged Skybuffer Solution based on SAP Travel & Expenses functionality. A socially and environmentally responsible solution which analyzes business trips KPIs in SAP environment thus adjusting business costs and revenues. RTE2 with additional dimensions for specific reporting controls travel expenses per business unit, mileage covered per trip, CO2 Emission per vehicle type/employee/subsidiary, etc. Upgraded SAP Fiori interface allows mobile data inputting. Google Cloud Platform integration collects credible data for ecological management system audit and contributes to the company’ sustainability. Analytics solution provides varied queries based on travel expenses data application in source systems. Extended version of standard SAP My Travel & Expenses Fiori application is efficiently used for credible data gathering for the purposes of ISO 14001 ecological management system audit.